Waldkirch, November 2018 – Every aspect of the new deTec4 safety light curtain, which SICK is due to present at the PLC IPC DRIVES trade fair, has been designed with simple commissioning and high availability in mind. By integrating IO-Link and NFC (near-field communication), completely new remote and on-site diagnostic options have been created. Other unique selling points are the smart presence detection and dynamic protective field width features, which enable users to solve new and demanding applications. With the exception of the basic Core device, all deTec4 variants are equipped with IO-Link and NFC, which is why this safety light curtain is setting a new market standard when it comes to sensor diagnostic options. Fitters are able to use NFC and the “SICK Safety Assistant” smartphone app to read out and verify the deTec4 configuration data in a de-energized state even before work begins – they do not have to wait until the device has been installed and wired. In addition, NFC makes it possible to visualize the signal quality of all individual beams, the supply voltage, output signal switching devices, and diagnostic messages on a smartphone during commissioning. While NFC and the smartphone app facilitate real-time diagnostics and rapid troubleshooting on site by taking a snapshot, sensor communication via IO-Link provides for continuous remote diagnostic data, as well as comprehensive data analysis and visualization in the SOPAS Engineering Tool. The operational status and configuration of all connected deTec4 devices can also be queried and tested during ongoing operation. Condition monitoring and predictive maintenance – all in line with the Industry 4.0 approach. Communication via IO-Link comes with the extra advantage of utilizing deTec4 data for other measurement and automation functions, for example, measuring the height of objects moving through the protective field. There is no need for additional sensor technology, so the safety light curtain helps in designing a cost-efficient plant. The deTec4 from SICK is the first and, as yet, only safety light curtain with “smart presence detection”. This features uses one deTec4, installed vertically, to monitor access to the hazardous area as the master sensor, while another deTec4, mounted horizontally, works as a cascaded sensor and detects people inside the hazardous area, thus preventing machine startup from the outside. The advantage for the user is how the horizontal deTec4 is able to ignore chips, fibers, weld sparks, or drops that can be created during machining processes and may fall into the light curtain – as a result, the machine will not be shut down, but will continue to operate as intended, guaranteeing maximum availability and productivity. When protecting traversing carriages in intralogistics or monitoring rail-mounted sleds for reasons of safety in a production environment, the distance between the sender and receiver will necessarily vary due to the process being performed. The deTec4 “dynamic protective field width” function can be used to solve these dynamic, mobile applications. The sophisticated display concept ensures the deTec4 is easy to use both during commissioning and in ongoing operation. For a start, a laser alignment aid built into the sender helps the fitter to position the sender and receiver correctly. On top of that, various color-changing LEDs visualize the operational status of the safety light curtain, the protective field, and the output signal switching devices. The display concept is completed by eight more multi-colored LEDs for on-site diagnostics. Depending on their color, they indicate the signal strength, alignment, and synchronization of the sender and receiver; they also signal warnings or failures as flashing codes. The deTec4 safety light curtain from SICK meets performance level e in accordance with EN ISO 13849, SIL3 in accordance with IEC 61508, and Type 4 in accordance with IEC 61496-1. Its basic device and functional features include protective field heights of 300 mm to 2,100 mm, the option of a reduced resolution, beam coding, the possibility of two-signal muting, and an extended temperature range of - 30 °C to + 55 °C. These options enable customers to tailor the deTec4 to fit their particular applications perfectly. 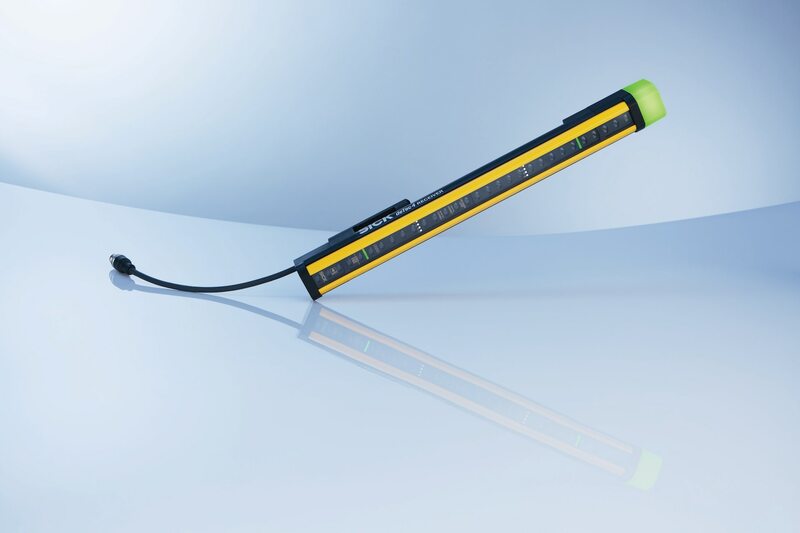 Advanced diagnostic options, reliable functioning even with obstacles in the protective field, suitable for dynamic monitoring scenarios, practical visualization – by offering users such incredible advantages, the deTec4 is laying the groundwork for a new generation of safety light curtain. SICK is one of the world’s leading producers of sensors and sensor solutions for industrial applications. The company, which was founded in 1946 by Dr. Erwin Sick and has its headquarters in Waldkirch im Breisgau near Freiburg in Germany, is among the technology market leaders. With more than 50 subsidiaries and equity investments as well as many agencies, SICK has a representative office all over the world. In the 2017 fiscal year, SICK had almost 9,000 employees worldwide and a group revenue of around EUR 1.5 billion. Additional information about SICK is available on the Internet at http://www.sick.com or by phone on +49 (0) 7681 202 4183.